MMph Huh? EEEYOO eh AAAAHH!! This is your standard spoiler warning. If you don't want Lego Harry Potter Years 1-4 or Lego Harry Potter Years 5-7 spoiled then you might want to disparate to somewhere else. This is Ghost, thanks for joining. The older I get the more cynical and picky I get. I'm not sure if that's just a byproduct of getting older that everyone eventually comes to terms with or if that's just me being hateful. I had seen the mighty plethora of Lego based video games on store shelves for quite awhile but completely ignored them. This was partially due to the fact that since 2011, Lego has been pumping out multiple video games a year on multiple consoles. If the gaming industry has taught me anything it's that behavior of that sort generally means there is a lack of quality somewhere so I just didn't care. Then...this happened. 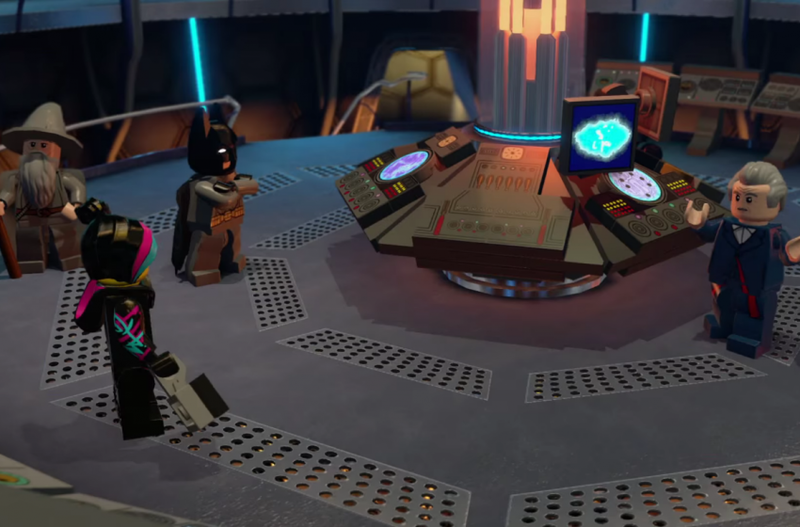 Doctor Who was coming to Lego Dimensions. Now I had taken notice of Lego Dimensions because of the crossover among multiple franchises that I actually gave a rip about (Wizard of Oz, Scooby Doo, Lord of the Rings, etc.) but once they announced Doctor Who was coming to the game and Peter Capaldi, the current Doctor was doing the voice acting I had to know more, especially with most Doctor Who video games being European releases only. However the starter kit for the game was $99!! That's quite a steep price even if it comes with a Lego portal you create yourself. Still being the cynic I decided that I would buy an older Lego Game that I could find used for less than $20 to see if I liked the gameplay and quality of their work before dumping that amount of money into something uncertain. So, I picked up both Lego Harry Potter Years 1-4 and Years 5-7 because... well if you're going to do Harry Potter you might as well do all of them right? Actually that's a slight bit of a lie. I picked up Lego Marvel Superheroes for the WiiU first but since I've found reviewing the Mother series in the wrong order has been somewhat problematic (especially for Earthbound Beginnings which I plan to cover next year) I decided to go in a more chronological order and review Harry Potter now just skipping Marvel Superheroes all together to hop straight into Lego Dimensions. 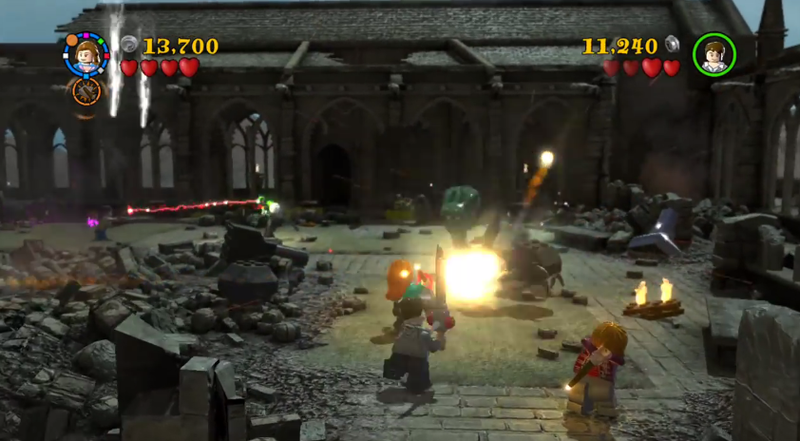 So, I popped in Lego Harry Potter Years 1-4 and what I found was fairly surprising. 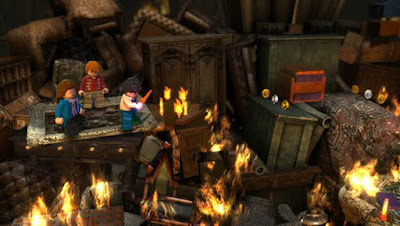 Since this is Lego Harry Potter Years 1-4 and Lego Harry Potter Years 5-7, the story is... exactly what you would expect it to be. It's a re-telling of the entire Harry Potter series from start to finish. If you don't know the story of Harry Potter then... I seriously question why you're bothering to read this. I would give a very brief description of what it's about but this franchise is too good to skim over. Go watch the movies (or read the books) if you don't know the story. You won't regret it. That's... honestly it. Obviously the game takes liberties where it needs to in order to give the game a decent length, more playable sections, or a boss battle here and there. For example in Sorcerer's Stone the scene in the Forbidden Forrest shows what is happening to Harry when he meets Voldemort. The game, however shows Harry seeing Voldemort then focuses on Hagrid, Hermione, and Ron getting through the forest to where Harry is. Another such example is the fact that Aragog is a boss battle in the Chamber of Secrets portion of the game; this makes you have to actually fight him instead of running away like in the movie. These types of deviations need to happen because this is a game after all. 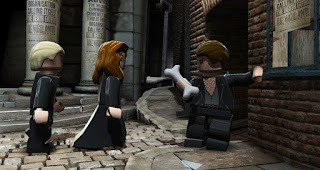 Occasionally the games will make a scene a little more humorous or take a different turn to fit with the Lego styled world that these games take place in but overall they were a very fun short re-telling of all eight movies. I was certainly pleased with what the game had for a story. However it's not 100% perfect. There is one slight negative thing I can say about the story and I'm not entirely sure how fair it is either. Some cutscenes go by incredibly quickly. This coupled with what I will speak about in the next section could easily leave some people confused as to what's actually happening in the story, especially if it's being played by people who haven't watched the films. That being said I'm not entirely certain who would actually choose to play these games if they weren't fans of the Harry Potter series and would have therefore either read the books or watched the movies. I would have liked for something a little different to have aided people if this was their first Harry Potter experience but what we had was still adequate enough if you paid close attention. As soon as you begin playing these games, one thing becomes instantly and abundantly clear. This is no voice acting in these games. Well, to be more precise there is no dialog in these games whatsoever. Yes everyone has a voice which can grunt, moan, yawn, and scream to get their point across but there are no spoken words in these games. At first I thought this was a splendid idea as it allowed for the producers to focus on content more than voices and also it wouldn't make avid fans angry over their favorite character not being voiced correctly. I was looking forward to this change of atmosphere... thirty minutes of caveman grunting later I was longing for some dialog! Actually truth be told I was longing for everyone to shut the heck up! This is specifically true of Lego Harry Potter Years 1-4. When most game developers want to make the world feel organic and real they include the reactions of the non-playable characters. Games like Grand Theft Auto spring to mind in which NPCs comment on your actions, insult you, or run away screaming for their lives. They attempted that sort of organic flow with Years 1-4 but when you have no dialog your options are limited. What we ended up with was every single NPC, with the exception of Malfoy, Crabbe, and Goyle, doing this sort of wave and greeting acknowledgement sound when you are within thirty feet of them. They don't just do it once either. If you stay within their circle of acknowledgement for longer than ten seconds they do it again and again. This can be particularly maddening when a room is full of people that you have to pass by multiple times to figure out the puzzle resulting in a jubilee of high pitched hellos driving you to the edge of your sanity. It's as if you were handcuffed to a Teletubby attempting to greet each and every person at the Million Man March. I've never wanted to shoot my television screen more in my life than being stuck in the Three Broomsticks with the Hyena Brothers. I was there for even longer because I couldn't concentrate on the puzzle at hand due to their annoyance! I never thought I could hate Fred and George Weasley but this certainly made it happen! I alluded to this earlier but for those people who haven't seen the movies, the lack of actual dialog could cause some confusion with the story. If you aren't watching the screen carefully at all times you could easily miss something fairly important story-wise because everything is visual and not audible. Yes, I still realize that the majority of consumers for this game will be Harry Potter fans and therefore this is no issue whatsoever but I just can't let this go without mentioning it. As a side note - later games in the series does have actual dialog. Lego Marvel Superheroes was fully voice acted and from the trailers I've seen, Lego Dimensions will be as well! 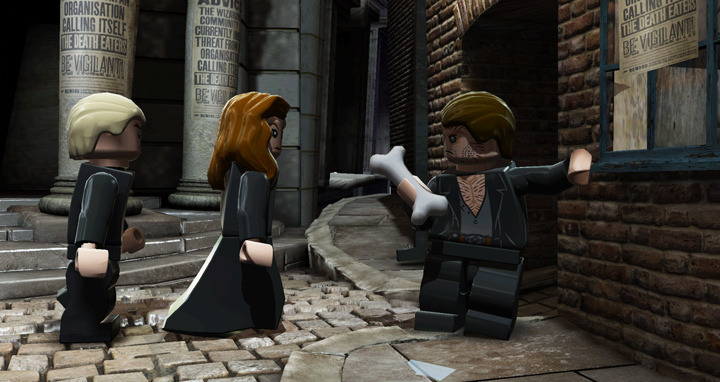 If there is one thing you can say about a Lego Game, it's that you are never in need of characters. 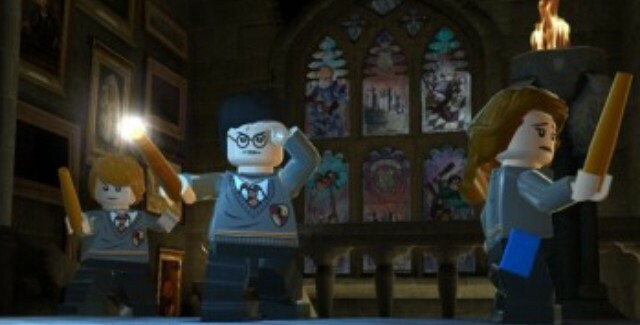 Lego Harry Potter is no different. Obviously you have the main three, Harry, Ron, and Hermione, but throughout the game you can unlock close to one hundred other characters. Some of these characters are given to you at certain points in the game, but for the most part characters have to be unlocked by completing certain tasks or solving certain puzzles during your playthrough. There is a two-fold reason for having so many characters. First of all many characters have special abilities that others do not have so that when you replay a level you can bring those special characters with you to complete puzzles you couldn't complete the first time of going through the story. I'll talk more about that in the Gameplay section. The second reason is simply due to the fact that people will have favorite characters, especially in a series as beloved as Harry Potter. This allows practically everyone to play as their favorite character. However I do think these games went just a wee bit overboard on the available characters. Many characters have multiple costume changes that you can select from, but rather than allow you to just select what outfit for what character, each outfit is considered a separate character and therefore has to be unlocked separately. Not only that but some character choices are just bizarre. While having characters like Voldemort, Hagrid, and Arthur Weasley make perfect sense because they are awesome characters who should be playable... others are not quite the same caliber. I'm sure everyone will be rushing to play this game as a Milkman, Oliver Wood, Marcus Flint, a random Witch in grey clothing, Doris Crockford, a Dudley's Gang Member, and of course Mr. and Mrs. Mason (the muggles who got a pudding to the head in Chamber of Secrets.) It's neat that they included practically everyone but I think they were wasting their time with a few. 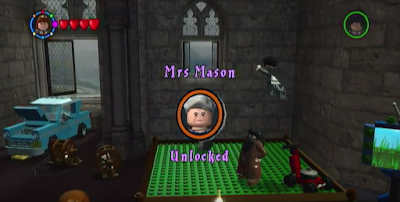 One other mildly confusing thing they do with the characters is the simple fact that all additional "non-essential" characters not only have to be unlocked but they have to be bought using the in-game currency of studs while you are in Diagon Alley. I would understand that better if they just handed you the character tokens left and right completely in the open but many of these are hidden behind puzzles or need special characters to unlock in the first place. If they are a challenge to unlock why do we need to spend money to use that which we unlocked? It's like going through the trouble of winning a video game tournament and the prize is the ability to purchase another video game for retail price. How would you like it if you were playing Smash Bros or Mortal Kombat and your favorite character was finally unlocked but now you had to play the game more to spend the money to actually use them. It's...really weird. Not to mention some of the characters are ungodly expensive. I played all of Years 5-7 and ended up with 3 Million studs. I had unlocked Bellatrix Lestrange and wished to use her to complete some of the puzzles you need a dark witch of wizard for...and she was 3 million studs to use!! WHAT?! I guess they needed to provide a reason to re-play levels so that you could grind money. Good gameplay can cover a multitude of other sins. If you are able to have fun and truly enjoy your experience then generally you can forgive some annoyances here and there. 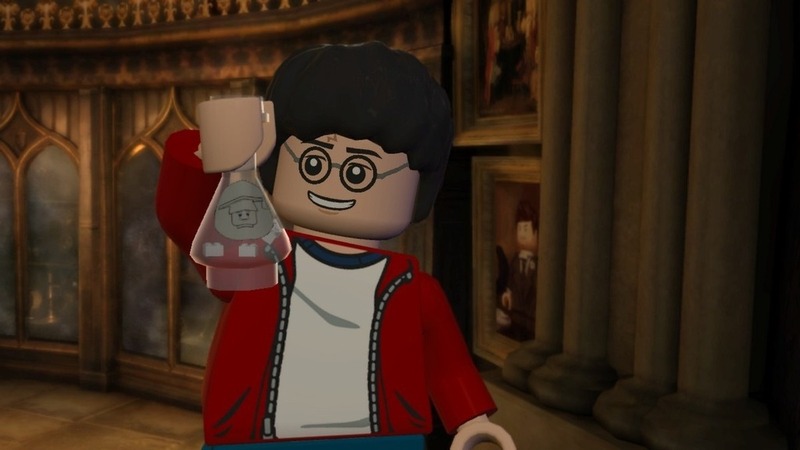 Somehow Lego has been able to capture the pure essence of video game joy and has injected it into most (if not all) of their games, Harry Potters included. Gameplay is where these two titles truly shine! Like most of the Lego video games, the gameplay is more centered around puzzle solving than actual combat. Sure there is some combat here and there but it takes a back seat to exploration and figuring out how to progress through a situation or room by means of what is in the room with you at the time. 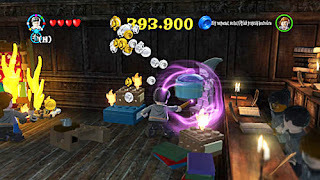 In the case of both Lego Harry Potter games, you are given a selection of magic spells to use. Each spell has a different effect and use within the world. 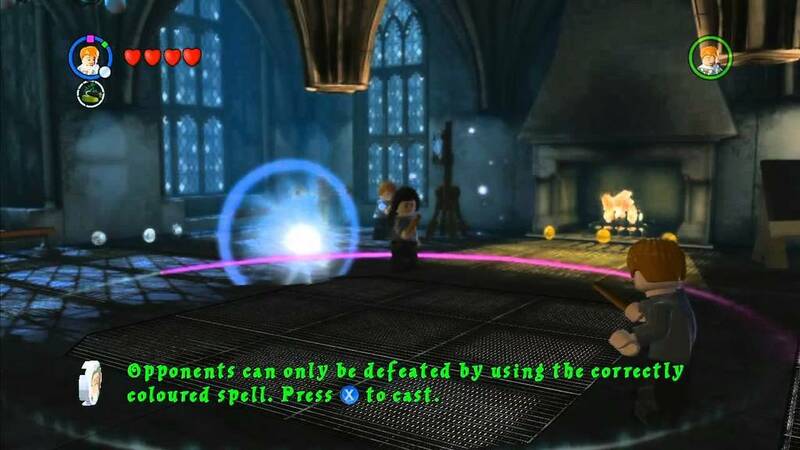 For example, wingardium leviosa is used to lift items into the air but also to assemble Lego pieces together into new creations. Likewise you have a sun spell for dealing with plants, a stunning spell for enemies, a water spell for fire and other puzzles, and a spell that can carve shapes into red Lego bricks. In addition to the spells that most people end up getting, you also have temporary items, potions, and individual abilities. 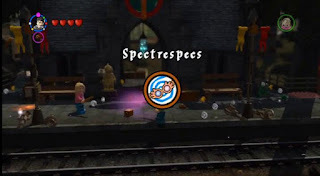 In some rooms you can put on a pair of Luna Lovegood's Spectrespecs to see invisible Lego bricks to use, or if you are one of the Weasleys you can open a Weasley box to fire off rockets or use suction cup shoes to climb walls. In other cases you need a potion to transform into someone else, or gain immense strength to move items. The individual abilities are a really interesting inclusion as well. Harry has his invisibility cloak, Ron has both pigwideon the owl and Dumbledore's deluminator (in the last year only), and Hermione has Crookshanks she can call to squeeze into tiny places. Other characters also have special abilities like Griphook the Goblin can open locked doors with his key, and Bellatrix Lestrange has the Dark Mark and Dark Magic to get past other obstacles. These individual abilities are key because each level is littered with optional puzzles and items that you can only complete once you've finished the level and came back to play in free play mode bringing any character you want. 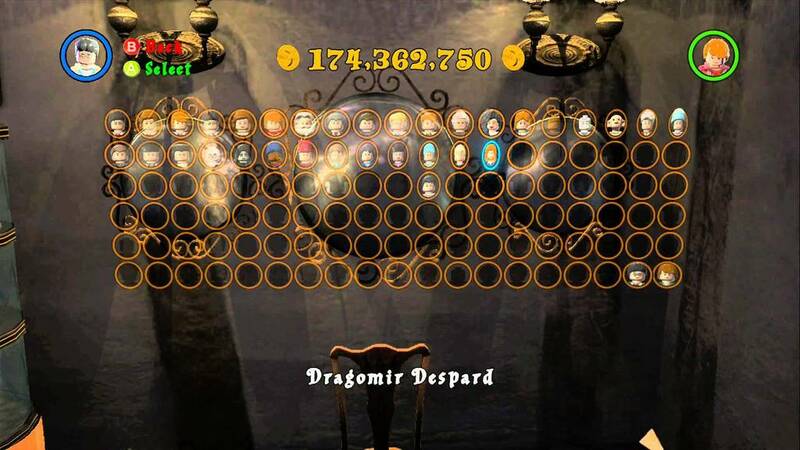 In face, the game actively encourages that you re-play levels by making certain characters or items be completely unobtainable when you first play it. For example one of the first levels of Year One has a lock on a cabinet which can be blown off with magic but you don't learn that spell till Year Four. 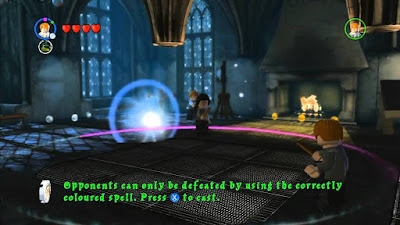 Years 5-7 also have obstacles littered everywhere that require dark magic to pass but you don't even unlock someone with dark magic until the very end of the game. It's a neat idea for completionists and for those just curious because you remember there are things you can't do but want to see what happens if you have the ability to do them. As stated earlier there is combat occasionally but for the most part it has taken a massive backseat to the puzzle solving and random platforming. Combat overall just consists of holding down the magic button till you've targeted the enemy or enemies on screen then releasing for a barrage of hexes that clear the room. Bosses can offer a bit more of a challenge because you have to actually do different things like stop items from hitting you and send them flying back at the boss. It's battle in its most simplistic form. However there is one change to that. In Chamber of Secrets we learn how to duel against Malfoy. It was pretty terrible and mostly existed as a mid-boss battle where you just dodge the hex and send one back at Malfoy. If that was the only kind of duel I was going to be disappointed. Thankfully that was not the case in Years 5-7. Years 5-7 brought back the idea of duels which placed you in a circular area against the opponent. You must match the spell they are going to cast and cast them at the same time. During a quick time event of mashing a button over and over you eventually overpower your opponent and take away one of their 4 health hearts. It's quite fun! One final thing to mention about the gameplay is how they deal with health and being defeated. You are given four hearts at the start of the level. If you are hit by an enemy you lose one heart. Obviously defeating enemies or destroying things on the map can often times give you hearts to refill your meter. However, if you're running into a bit of trouble with a section and you lose all of your hearts, your character falls to pieces. The first time this happened to me, I assumed there was a lives system in place or that you lost that character for the remainder of the level. NOPE! Within seconds the character is back on their feet and ready for battle with a full 4 hearts worth of health. The only thing you have lost is 1,000 studs out of your total for the level. If you have no money or less than 1,000 studs it just takes you down to zero and you keep playing. There are no "failure" or "game over" screens. If you're having trouble you just keep on trying till you beat it. For someone who isn't that great at video games to begin with.. I really loved this feature of these games. As one can expect with a game primarily focused on puzzle solving, there will be a few puzzles here and there which shall be a little more challenging than others. Normally games would increase the challenge level of the puzzles as you progress through the game. Indeed, I thought the puzzles would be harder in Year Four, and Year Seven Part Two respectively. However I was dead wrong. These games have random challenge spikes for one particular part of a puzzle with no rhyme or reason whatsoever in their execution. Even in Year One I was having to look at a guide once or twice to progress through the room because something the game thought was going to be simple and obvious clearly was not. My favorite moment of absolute irritation was when playing through the Three Brothers story. In one section you had to don the invisibility cloak and send three pumpkins hurdling toward Death so that he can leave allowing the other two brothers to pass. I lost every bit of my studs for the level at this part because while I was using the correct spell to lift the pumpkins, I had always been tasked with pushing the directional lever forwards to send items at an opponent even if they were off to the left or right. Death was to the left but pushing the stick forward as I had done through all six previous years just sent it smacking into the windmill out of my reach. Instead I was supposed to push the directional button to the left to allow it to smack Death in the head. First and only time that was necessary and I received no word or guidance. There are several other moments where something that should have been obvious was not but that one was the most irritating. One other thing that confused and shocked me was the extreme difficulty of the final level in Year Seven Part Two. While I fully expect the final level to be the most difficult of any game, I certainly wasn't expecting this. 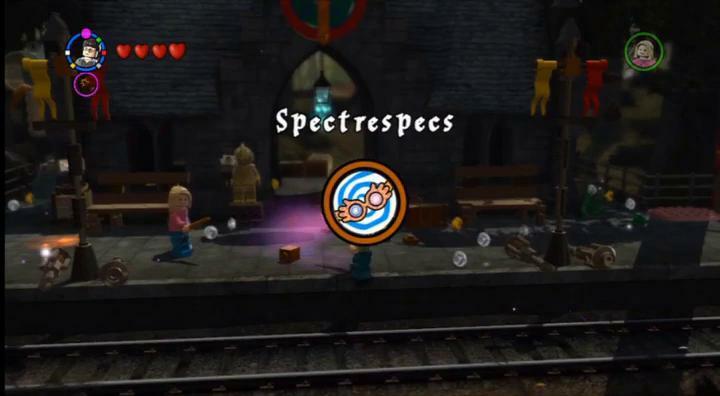 During the section where you control Molly Weasley and Kingsly Shacklebolt through Hogwarts' attic area, you are bombarded by Death Eaters shooting hexes at you. Normally this wouldn't be a problem because you could just shoot an enemy and they would disappear. Death Eaters however take a few hits then disappear only to reappear in another location on the screen. Death Eaters cannot be defeat at all only slightly delayed. When you have five or more of them on your case at all time it's difficult to get anything done especially when the partner AI in this game just sort of stands around and does no fighting on their own (a feature they changed for Marvel Superheroes) Quickly I lost all of my studs and still couldn't simply get from one side of the room to the other because I just kept dying over and over and over. Eventually I had to put on the Invincibility Cheat Code in the game just so I could get to the other side of the room. The final battle was just as bad. While fighting Voldemort was an easy quick-time event, this was interrupted by Ron, Hermione, and Neville fighting giant spiders, Death Eaters that wont die, Death Eaters that appear off screen behind you that you can't even shoot to get away, dementors slowing you down and Nagini spitting venom and biting. It's a mad house of difficulty and I'm not entirely sure how people could beat it without the provided Invincibility cheat! I honestly could have talked in more detail about several other items such as the in-game cheat codes, the partner AI that does nothing, or the interesting types of levels such as being underwater in the Lake. There are many things in these games to experience and enjoy for yourself, and I do mean enjoy. I may have mentioned several negatives during the course of this review but none of them change the fact that I truly enjoyed these games in their entirety even when I was getting irritated. The fact that I was able to walk through a re-creation of Hogwarts, the Burrow, Hogsmeade, King's Cross Station, The Forbidden Forrest, etc. made my inner Potter fan squeal with joy. In a time where many games are going for gritty realism and multiplayer matches it's a solid breath of fresh air to see something honoring the source material but not afraid to have a few laughs along the way. It's great to see something that allows a multiplayer experience but doesn't detract away from the single player either. While Lego Harry Potter was rough around the edges it was clear that these people are refining their craft. They are actively taking good ideas and making them better. They are taking things that don't work and either removing them or making them work. Lego Marvel Superheroes is a testament to that as practically every problem I have with the Harry Potter games has been eliminated for the Marvel Superheroes one. Lego has done something for me that I didn't realize I needed. They made me remember once again why I love video games. They place fun and enjoyment at the forefront and have captivated me by their greatness. If you enjoy puzzles, fun games, or any of the numerous franchises they have created games out of then I highly suggest that you pick up one of their games at your next convenience. You won't regret it.